This tuna salad & apple croissant sandwich is so good and easy to make, it will make its way into your lunch and busy weekday dinner rotation. The secret is a light, yet creamy tuna salad that takes just a little bit of prep work to make it special. But that work is worth it, as it makes plain, boring tuna into a delicious tuna salad. The rest is easy-peasy, sliced apples and store bought croissants make the best tuna sandwich you’ve had! If you want a super creamy tuna salad, break up the pieces of tuna really well. Stir the tuna with a fork, pressing down and breaking up any chunks. Do this, basically, until your hand hurts. Then take a break, and keep stirring and breaking up the tuna. Like Al Pacino says in Frankie and Johnny “I am defined by my tuna sandwich. I take the tuna out of the can and I work it between my fingers till its real soft.” Now, you can use your fingers if you like, but a fork works pretty well too. Add the tuna to a large bowl. 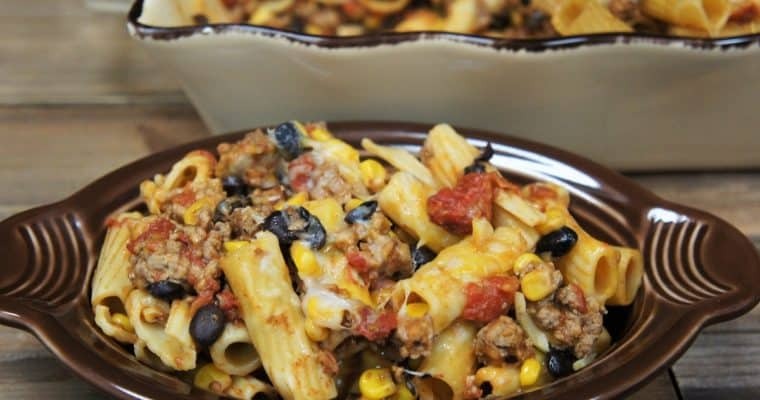 Make sure the bowl is large enough so you can really get in there and stir without spilling. Break up the tuna, then add the cream cheese, mayonnaise, onion, celery, mustard, salt and black pepper. Stir well to combine. Taste the tuna salad and add more salt and pepper only if needed. Cover the bowl and refrigerate until the tuna salad is nice and cold. Add a generous amount of shredded lettuce to the bottom half of the croissants, top each with ¼ of the tuna salad and ¼ of the apple slices. Top the croissant and serve. 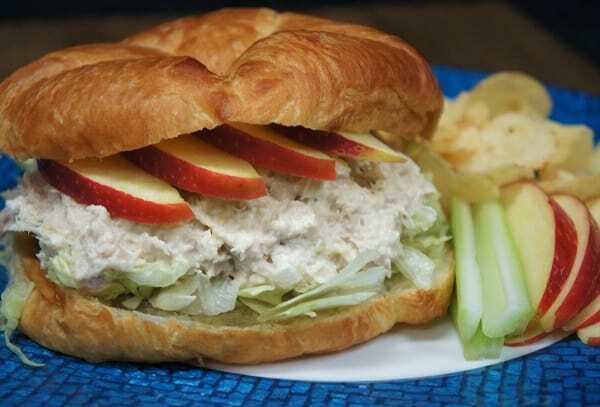 Serve the tuna salad & apple croissant sandwich with extra apple slices, celery sticks and chips if desired. Enjoy! Dice the onions and the celery as finely as possible. The trick is, to have a subtle flavor and just a little bit of crunch. Any large pieces of celery or onion will take over the tuna. The smaller the pieces, the more they will take a background role. If you’re using pouch tuna there is no need to drain. If using canned tuna, drain it, but don’t leave it bone-dry. Apples turn brown very quickly, so don’t slice them until you’re ready to build the sandwiches. If you need to slice them ahead of time, add just a little bit of lemon-lime soda (like Sprite or 7-UP) to a bowl then toss the apples in the soda. If you do not have lemon-lime soda, a little bit of lemon or lime juice, will also do the trick. 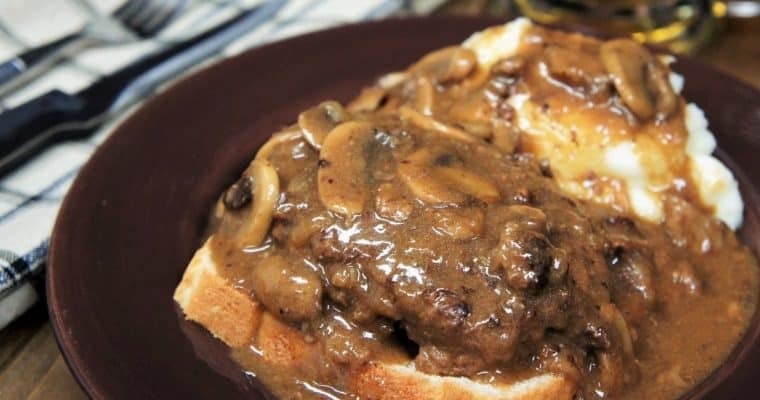 This Salisbury Steak Open-Face Sandwich is comfort food at its best! Perfectly seasoned lean ground beef is smothered in a flavorful deep-brown onion and mushroom gravy, and served on a slice of white bread.